Click on image to open the order form for this year’s calendar. This year’s annual 2017-2018 IHEA/ICOO Calendar featuring my artwork is now available. 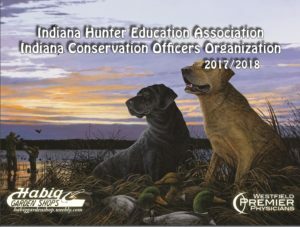 This large 10.5″x14″ full color calendar contains many new paintings from the past year as well as important Indiana hunting dates and nature fun facts. It runs from Sep 2017-Aug 2018. You can easily pick yours up for only $5 each at the Indiana State Fair inside the DNR building. If you aren’t able to make it to the fair, no worries. You can get yours by opening the form to the left and have it shipped to you at $5 ea + $5 S&H. 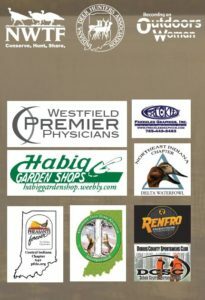 The reasonable price for this calendar is made possible by the great sponsors to the right. More details about the calendar project follow. This is a great way to enjoy my artwork throughout the year. 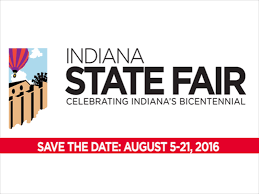 The Indiana State Fair usually signals the time that summer vacations draw to an end and the kids are returning to school. For me, it marks a proud fundraising partnership I have had with two great Indiana organizations over the last 10+ years as they kick off their annual calendar sale. 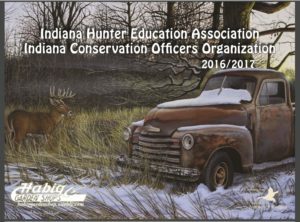 The Indiana Hunter Education Association and the Indiana Conservation Officers Organization utilize their presence in the DNR building at the Indiana State Fair to educate and promote responsible stewardship of our natural resources. 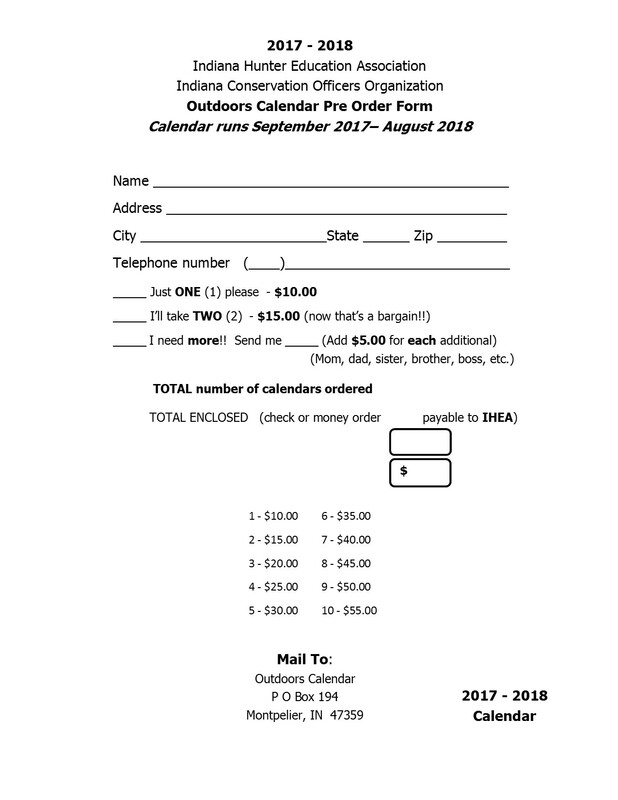 The sale of these calendars at the State Fair and by mail order help to defray the cost of their programs. The calendar runs from September through August to correspond with the beginning of the hunting seasons which also doubles as a very convenient school calendar. Important hunting dates and events as well as fun nature facts pepper the calendar throughout. 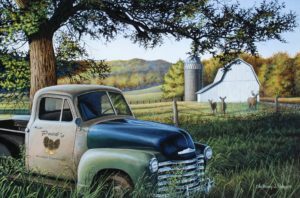 While my paintings of nature scenes have been the hallmark of the artwork featured, this year’s collection is made up entirely of old farm trucks featuring four new paintings from the past year. You can pick up your full color 10″x14″ calendars at the State Fair DNR building for only $5. As a native of Belleville, Illinois, like most kids, I grew up as a fan of Cardinals baseball and continue to follow them to this day. Years back I relocated to central Indiana where there is definitely a void of major league baseball. In my adoptive State of Indiana however, Basketball is king! If you ever had any doubts of that, this blog should convince you otherwise. 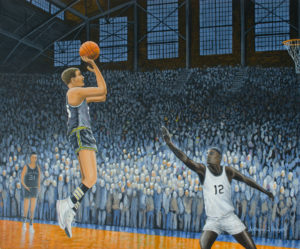 A few months back, I began a painting project to recreate the most historic shot in Indiana basketball history. Doing a basketball painting….. in Indiana! I think I am now officially…. link at the end of this blog where you can read the Star’s feature and also see my interview discussing the painting. 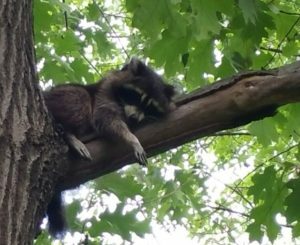 The Indianapolis Star did a great job capturing the background and scope of the project, however I would like to share further insights with you regarding the research and challenges behind it. First, all research video and photos from 1954 were in Black and White and many of poor resolution and detail. In fact, the still shot from the video (shown above) is very grainy and blurry. 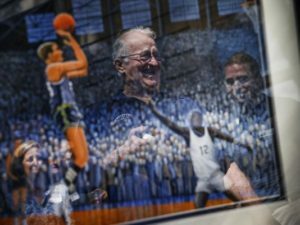 Secondly, the image cuts off all of the ball and even part of Bobby Plump’s head and fails to show the size of the crowd at the Butler Fieldhouse. Especially challenging was the fact that there was no way to get any facial recognition of Plump from this image. These challenges were tackled one at a time. Second, I discovered early on that the scene really needed more height which would show the size of the crowd and expansiveness of Hinkle Fieldhouse. Hinkle Fieldhouse resides on the campus of Butler University and is a registered National Landmark. Its iconic windows and rafters would add additional drama to the painting. So off to the Butler campus I went with my camera in hand to photograph the Fieldhouse from the perspective of the video still shot. I was able to get great photos of the upper reaches of the Fieldhouse and incorporate them into the scene. While there, I had a young man on the Butler staff take some shots from the same floor location and also pose as the defender so that I could study how the uniform would lay and gather details on body positioning. Third and most challenging was to capture Bobby Plump’s likeness in the painting. Again, only black and white photos existed and most of them did not have Bobby’s face positioned in the proper orientation. I poured over dozens of photos provided by those commissioning the project and had to work hard to capture Bobby’s profile and hairstyle. His daughter was able to give valuable feedback as I went through this process. Finally, other research was done to finish off the details. 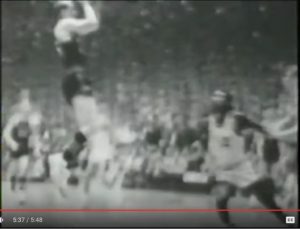 I studied photographs of crowds, basketball, goals, and Converse shoes from the era. You can see many of the research photos in the slide show provided. To top it all off, I was able to record the last thirty seconds of that historic game onto a record-able button and provide it along with the painting. It does a great job of capturing the excitement of that moment 62 years ago. You can watch the video and hear the audio of Plumps last shot at the bottom of this blog. I am pleased with how well received this painting is, and many have inquired about obtaining reprints. 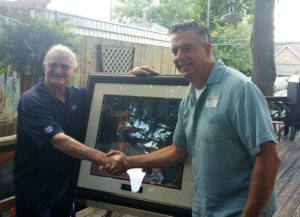 We are hoping to partner with the Milan Museum and Bobby Plump in order to bring framed reprints with Bobby Plump’s and my signature. Please contact me if you would like further information about obtaining this collectible reprint. Click the image above to read the Indy Star feature and view the video interview. In conclusion, I’m honored to have been able to play a part in re-creating this historic scene which holds so much importance to generations of basketball fans in the state of Indiana and beyond. I look forward to future projects like this and welcome the challenges they bring. If you would like to read the Indy Star’s account of this project and see my interview, click the image to the left. That’s all for now. Thanks for tuning in. Sorry. Contrary to the title’s suggestion, you’re not going to get any dirt on my childhood growing up in Belleville, Illinois. Another cheap ploy, I’ll admit, in trying to grab your attention. Summer is however a time when the kids are out of school, heading off to camps, and having lots of fun. On the other hand, adults seem to be cheated out of all the summer excitement. For many of us, work continues to get in the way. So I have to ask, where are the fun camps and vacations for the grown-ups? Fortunately, Canada can offer a refreshing break from the heat of summer and be the perfect fit. Do I have a proposal for you! 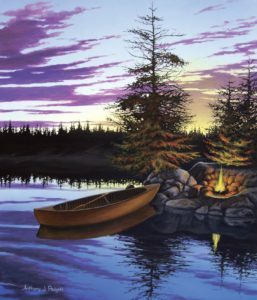 This year I am leading an art camp in Ontario Canada at Cat Island Lodge. 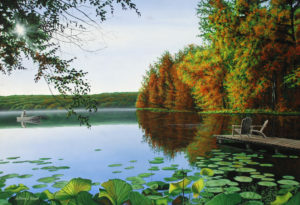 (Check out the photos above) From July 23rd – 30th students will be painting the splendor of Canada on Trout Lake. This will be a “Plein Air” painting camp. Each day we will be traveling from the lodge by boat to a different location. We will take our provided Plein Air Painting easels and supplies and spend at least five hours painting the scene in front of us. We will then return to the lodge and have a daily art show for the other students, staff, and visitors to enjoy. En plein air (French pronunciation: [ɑ̃ plɛn ɛːʁ]), or plein air painting, is a phrase borrowed from the French equivalent meaning “open (in full) air”. It is particularly used to describe the act of painting outdoors, also called French: peinture sur le motif (“painting of the object(s) or what the eye actually sees”), where a painter reproduces the actual visual conditions seen at the time of the painting. I can assure you that painting won’t be the only enjoyable part of the trip. Traditional freshly caught Walleye shore lunches will be on the menu as well as daily breakfasts and dinners prepared by the staff at Cat Island Lodge. 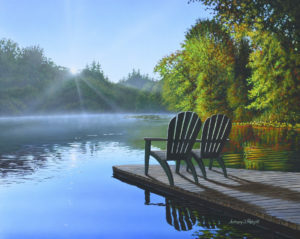 There will also be time for fishing, relaxing, and being one with the great outdoors of Canada. If conditions are right, you may even be able to glimpse the beauty of the Northern Lights. There are still a few limited spots available so if you are interested, contact us and we will get the ball rolling. You deserve a break! Whether you are a beginning painter or more advanced, come along and join in on the fun. Until the next blog, thanks for tuning in! My paintings take weeks, if not months to complete! As I have shared in earlier posts, painting for me is a process. From field research to original design concept to completion can be a difficult, lengthy, task. In fact, I still have some paintings that are incomplete and have been for some years. Its not that I abandoned the painting or didn’t like it, it’s just that sometimes artists can get stuck just like novelists suffering from writer’s block. The goal is for inspiration to take hold once again to complete the piece. It is because of this investment of time, thought, and toil that original paintings command a high price. For the serious collector and fan of my artwork however it can have many benefits. Below are a few. Collecting artwork is enjoyable. Many of us may have collections of one thing or another, but artwork collections are meant to be displayed and enjoyed by the collector and their family and friends. 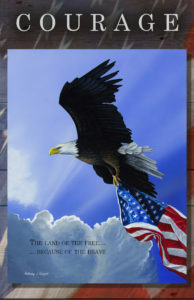 The artwork can adorn homes and offices. In addition, the artwork collection can be of a particular artist, style, or subject. Its entirely up to the collector. Collectors usually feel a close connection to both the artwork and the artist. It is rare that I sell an original painting without having multiple conversations with the buyer. 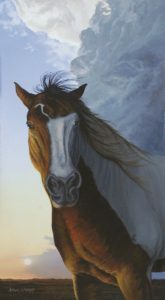 I share with them the inspiration behind the painting, and the details behind its completion. 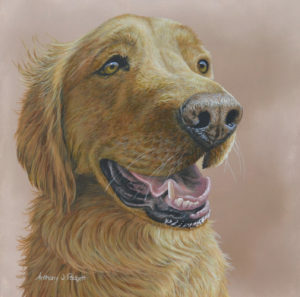 In cases where the painting was commissioned, it get to know the customer even more and understand their passion for my artwork and the subject to be painted such as a beloved pet. This shared experience between artist and collector is quite rewarding and I have many friendships as a result. You can appreciate art and art can appreciate. Like any investment, value appreciation is no guarantee. However, I’ve been fortunate in my 30+ years as an artist to see some of my artwork appreciate sometimes 2-5 times their original value. As I always relay to my collectors, a painting is only worth as much as someone is willing to pay for it. That could mean more or even less than the original purchase price. Original paintings often become family heirlooms. This is especially true when paintings are purchased when a family takes root. Children may grow up with a piece of artwork and have a strong connection to it. As they get older it may be passed on to them to enjoy with their own family household. You tell me. Above are just a few reasons collecting original artwork is beneficial. If you have other reasons you like to collect, please share by posting acomment to this post. Have fun with the following survey! What is different about my painting now? 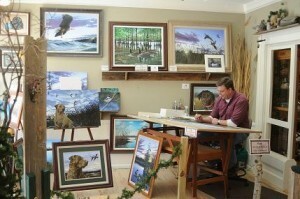 coming year I plan to become more engaged in entering competitions such as duck stamp competitions among others. My productivity has increased and I now have more time to concentrate on different landscapes and subjects. One immediate benefit is that I have a greater inventory of original paintings for sale. You can see many of these pieces scattered throughout this blog and if you have a genuine interest in purchasing an original painting visit the >>Originals for Sale Page<< and contact us. Finally, if you own an original Anthony J. Padgett painting, I want to hear from you. Over the last 30 years, I have sold many originals and as time wears on, faces, names, and paintings begin to blur. I want to reconnect with owners and collectors of my artwork. Please email me by visiting my >>Contact Us Page<< and include the following. I am about to embark on a new painting where I really want to capture the essence of fly fishing. Since I have yet to begin putting paint to canvas, I thought it would be fun to invite all of you along for the ride while I develop it from start to finish. 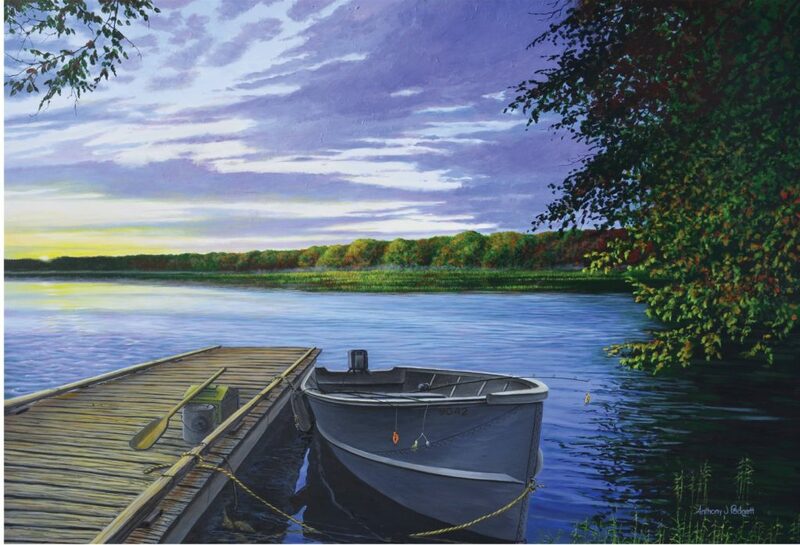 To get you into the fishing spirit, I’ve included my painting from January of this year titled “Let’s Go Fishing.” For those viewing on a computer, you can zoom in and see details. See if you can spot the stringer of fish in the water indicating a successful catch. Now, since I had to do research of my own, I thought it only fitting to assign a little homework for all of you. So here it is…. As a suggestion, a friend recently recommended to me “Salmon Fishing in the Yemen”. Check out the trailer below to see if it might interest you. 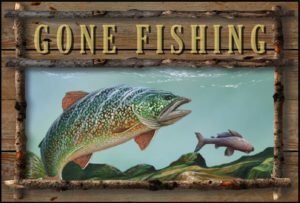 If you have other favorite fishing movies, feel free to share. I hope you continue to tune in as I continue to develop this story. With school out of session or nearly being so, all the kids are hitting the pool for a refreshing swim. 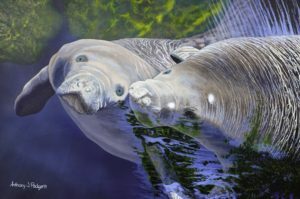 I couldn’t think of a better way to share one of my 2015 releases with all of you as it features a manatee and calf on a swim of their own. It is titled “Salt Water Ballet” and I researched these creatures on Crystal River, Florida a few years back. For the serious collector, the original painting is still available. I enjoy your feedback. Tell me what you think! With summer break here, many of you will be going to the beach, lakes, and pools. You might just need a tote bag to hold all the goggles, toys, lotions, etc. Some of these designs might just fit the bill. In fact, my entire library is now available to place on tote bags, pillows, cell phone covers, note cards, and more. Go for a swim of your own and HAVE FUN!!! No this isn’t going to be some long rant about how I was insulted or disrespected. That was just a cheap way to get your attention. This is going to focus on how my artwork has been transformed into personalized art. It was about 10 years ago that i first began developing artwork that could be personalized. 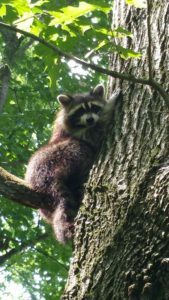 Through my many customers, I learned that most had businesses, farms, cabins, lake houses, etc. This provided a great opportunity to have those names prominently featured on artwork that they could display in the home, office, or elsewhere. The challenge for me was to make that name and/or logo be a part of the artwork not simply a gross overlay of text and image that distracts from it. Fortunately, old trucks fit the bill. Why? Memories. As a subject, old trucks have broad appeal and most of us can remember Grandad’s old truck or may have owned one ourselves. I love old trucks! I especially like vintage Chevy Trucks from the 40’s and 50’s. This makes researching and painting them quite enjoyable. Truck doors make great places to add personalizing such as logos and names. I strategically place the truck in a position where the door is visible and at an angle suitable to drop text and logos. 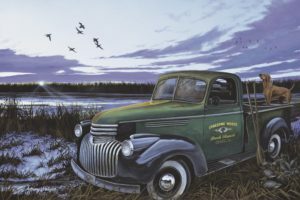 Wildlife scenes can easily incorporate an old truck. Whether it be in a barnyard, field, woods, or a country lane, trucks look great in these settings and I am able to add wildlife easily and natural. 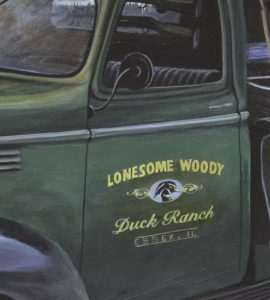 While truck paintings are perfect for personalizing my artwork, they aren’t the only ones. I have other paintings where the barn or a sign post is able to be personalized. If you have other ideas for how you would like to see personalizing, let me know by leaving a comment. Through the years, “Man’s Best Friend” has provided plenty of inspiration for my artwork. 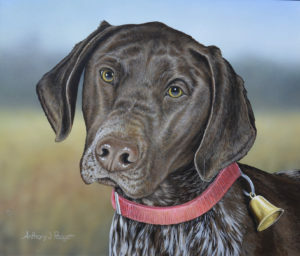 For instance, my yellow lab, Toby, has been featured in many paintings and one piece in particular called “Diligence” earned for me the honor of “2008 Ducks Unlimited International Artist of the Year.” Sporting dog breeds especially make great subjects to include in a wildlife scene. Their intensity, focus, and determination are tangible when they have picked up the scent and their instinct kicks into high gear. Capturing those moments in paintings is most enjoyable. Dogs and other pets also make great companions. One of the best things about pets is their ability to raise our spirits and give us unconditional love and affection. They are great companions and definitely part of the family. This is one reason many people like to commission paintings of their beloved pets. Over the years, I have painted many of these pieces of artwork, and their size, composition, and cost have varied dramatically. You can see many of these paintings in the included slideshow at the top of this post. 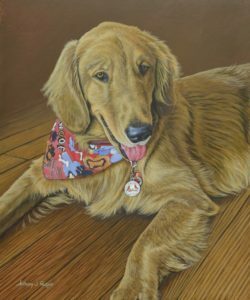 While having an original painting of your pet may be attractive, unfortunately for many, the price to commission a large original painting exceeds their budget. This is one reason, I decided to start a Companion Series of pet portraits for my customers. These smaller (14″x14″) originals really focus on your pet (a dog, cat, turtle, groundhog, or whatever your companion may be) as the main subject and I am able to capture their personality and spirit in a painting. These are sure to be family keepsakes for years to come. Just for fun, take the poll & see the results! 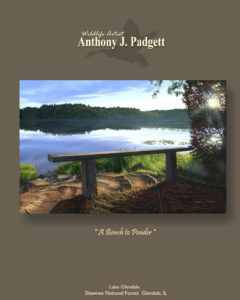 The Anthony J. Padgett artist blog begins! For many, art is very personal. As an artist, I too want to have a personal connection to the subject matter I’m painting. My frequent trips to the field observing and photographing structures, lighting, wildlife, and landscapes give me the encounters in nature that will potentially show up in a future painting. When I am behind my brush, I recall the different elements in the scene as I experienced them in the field. I remember the sounds, temperature, smells, and the mood of the day. I try to capture these experiences in a painting that will connect with others. I am often asked what inspired the piece, where it was, when it was, etc. As the conversation continues, a definite connection is made between the artist, the viewer, and the artwork itself. Unfortunately, time and distance are obstacles making it difficult to speak with many of you in person and it is for this reason that I need to find other ways to communicate. 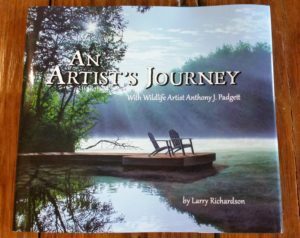 My first published book “An Artist’s Journey with Wildlife Artist Anthony J. Padgett” co-authored with my good friend and fishing buddy Larry Richardson was a good first step in bringing my story to you. 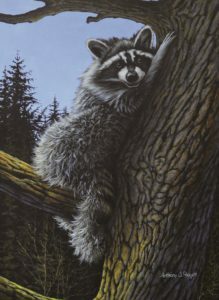 This coffee table style book shares my journey into wildlife art and features a large gallery section with over a hundred of my paintings. I realize however that publishing a book to share with you is not enough, so I have a plan….. Through it I am going to share more stories, experiences, art releases, and updates on my artwork to you. I will also try and include a special offer to each of you in every blog entry. 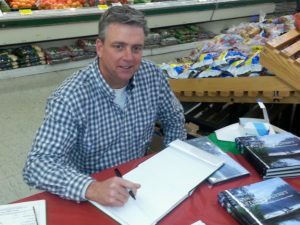 As my blog develops, please share it with your friends, family, and others who you think may enjoy following along. There are convenient social media share buttons at the top and bottom of the page to make sharing my blog a snap. Stay Tuned! It should be a fun journey for all of us. Just click the image above and enter promo code: JOURNEY at checkout.